Toyota is about to become the world's largest automaker. But you didn't hear it from them. At a news conference Friday, Toyota executives laid out a production target that likely will allow it to steal the bragging rights from General Motors next year. But soft-spoken company president Katsuaki Watanabe chose to focus on the company's plan to beef up quality control, rather than bragging about topping GM. "That's just what the results may be," Watanabe said quietly at a hotel in Nagoya, near the company's headquarters in Toyota city. Watanabe noted that Toyota's good fortunes had gotten a boost from a major outside factor — surging oil prices that made the company's cars more appealing to drivers. The Japanese automaker set a global production target of 9.42 million vehicles for next year, marking a 4 percent increase over the 9.04 million vehicles it expects to produce this year and easily beating the 9.2 million General Motors Corp. is estimated to have produced this year. The bullish outlook lifted Toyota's stock to an all-time closing high of 7,800 yen ($66) in Tokyo. Detroit-based GM has not given targets for next year, but it has been forced to scale back production recently after seeing its market share eroded by Toyota and other Asian automakers, which have a reputation for better mileage. Watanabe also told reporters the company was considering adding another plant in North America — a region where Toyota and GM's contrasting fates have been especially stark. He did not give details of the plans. Instead, he spent more time talking about how the company had to brace for bigger size by beefing up quality controls at all stages, including design and development as well as production. Toyota has been plagued with a rising number of recalls as it standardizes parts to cut costs and develops more vehicles at a faster pace. Its challenge is to maintain its reputation for quality cars and customer satisfaction as it continues to rev up production. "There will be no growth without quality," Watanabe said. He said quality will be closely monitored at all levels of production, including design, development and procurement. Watanabe said he expects recalls in new models to taper off in the coming year, as the measures the company has taken recently kick in. But he acknowledged that worries remain about older models on the streets. "The recalls have alarmed society and caused worries for our customers. I'd like to take this opportunity to apologize again," he said. Tsuyoshi Mochimaru, an auto analyst with Deutsche Securities in Tokyo, said Toyota was making all the right decisions in delivering attractive models perfectly timed to consumer tastes. "The growth highlights the fantastic reputation Toyota has won for its cars," he said. "Toyota may need to set the next goal to keep its motivation up if it becomes No. 1." Although GM says the perception its cars are gas-guzzlers is unfair and inaccurate, it is undergoing massive restructuring after racking up more than $10.6 billion in red ink last year and $3 billion more in the first nine months of this year. Toyota, on the other hand, is reporting record profits, churning out best-sellers like the Camry and Corolla as well as carving out a reputation in hybrids, which use a fine-tuned technology of switching between a gasoline engine and electric motor to save fuel. 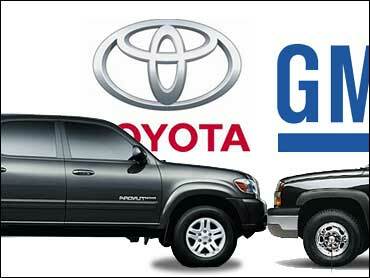 In addition to the production targets, Toyota, which passed Ford Motor Co. as the world's No. 2 automaker in 2003, also painted a bright picture of sales in 2007. It expects to sell 9.34 million vehicles globally next year, up 6 percent from 8.8 million expected for this year. Although Toyota's production methods, which empower assembly line workers and trim inventory, are praised by experts, transporting that production to new places remains a challenge. Toyota is opening new plants in Russia, Thailand and China next year to keep up with demand. Of Toyota's projected volume for next year, overseas production will rise 8 percent to 4.27 million vehicles while its domestic output will increase 1 percent to 5.15 million vehicles, the company said. The projections include Toyota subsidiaries, truckmaker Hino Motors and Daihatsu Motor Co., which makes small cars. In the U.S., the first Tundra pickup trucks rolling off of Toyota's Texas plant will arrive in showrooms in 2007, a sign of Toyota's ambitions in a lucrative sector dominated by American automakers. Toyota has used its ample coffers to purchase significant stakes in two of GM's former Japanese alliance partners — Fuji Heavy Industries, the maker of Subaru cars, and truckmaker Isuzu. Toyota will be using Fuji's Indiana plant to make Camrys starting in spring 2007. GM used to be the top shareholder in Fuji, but sold its entire 20 percent stake last year as part of its efforts to raise cash. Toyota bought an 8.7 percent stake in Fuji for about $315 million to become the top shareholder. Last month, Toyota bought a 5.9 percent stake in Isuzu Motors Ltd., well-known for its diesel technology that Toyota is eager to gain — half a year after GM sold its entire 7.9 percent stake in Isuzu. Toyota Executive Vice President Kazuo Okamoto was as nonchalant as Watanabe about his company's imminent rise to the top. "We aren't that concerned about vehicle numbers," he said. "But we are determined to go at it to develop cars that make a lot of people happy." Perhaps the attitude in the executive suite at Toyota is similar to what the famed 16th century Japanese swordsman Miyamoto Musashi once advised: "Do not let the enemy see your spirit."